At the time when Microgaming is hosting the MPN poker tournament in the wintry Tallinn, Estonia, its Mega Moolah slot is preparing to crown its luckiest player to date, who’s going to take home no more or less than over €19.5 million! Let’s take a look at some interesting figures and see what else they have in store for us in 2019. Here are some historical facts for you. Last year, a total of nine casino players triggered a seven-figure progressive prize across all Microgaming jackpot slots, which made a total of more than €40 million in winnings. The biggest of them all was surely hit on the famed Mega Moolah slot, when a Grand Mondial Casino player struck the world’s biggest online game jackpot, €18.915,872.81. And that happened just 4 months ago! The second most popular Microgaming jackpot game, Major Millions 5 Reel, paid out no less than over €3 million in prize money last year alone as well. 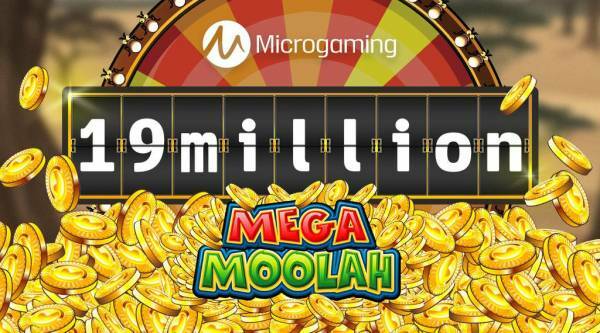 With its help, Microgaming’s progressive jackpot network has awarded more than €980 million over a lifetime. And with the Mega Moolah countdown, it’s about to hit the out-of-this-world €1 billion mark! There’s more exciting news for all slots fans as the developer is getting ready to unveil new and thrilling games at the annual iGaming conference ICE in London. One of the headliners is a branded slot Village People, which is being developed by one of Microgaming’s exclusive studios, Fortune Factory. For others, it’s the Lara Croft comeback that excites the most, which will also make an appearance this year thanks to the masterminds at Triple Edge Studios. Some equally promising video slots to come out in 2019 are the Agent Jane Blonde Returns slot, from Stormcraft Studios, the cyber-punk themed Shogun of Time by Just For The Win, and Babana Odyssey by Slingshot Studios. Finally, the company has also announced an upcoming table game, Blackjack, which will give their casino portfolio a much-desired refresh in partnership with Switch Studios as well. That being said, it promises to be another exciting year for Microgaming fans, many of whom probably can’t help but wonder what on earth has happened to Mega Moolah’s regular €4-million prizes. See our full list of Microgaming casinos to choose the best playground to try your own luck and stay up to date with the latest releases.